As if Apple wasn't facing enough headphone controversy, iPhone 7 and 7 Plus users have been reporting an inconvenient problem with the wired Lightning EarPods that come with the phone. 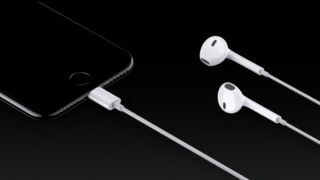 The issue appears to be that when the EarPods are connected to the phone's Lightning port the remote volume control becomes unresponsive after a few minutes of inactivity. Users are reporting that though their audio continues to play, they find themselves unable to change the volume, access Siri, or answer phone calls. The problem doesn't happen every time the headphones are used, and it can be temporarily fixed by simply unplugging the headphones and plugging them in again. But it's certainly less than ideal for new iPhone owners and Apple itself. Fortunately, Apple has acknowledged the issue and appears to be on the case, with a spokesperson for the company telling Business Insider that a fix will come in a future software update. It's not certain when this software update will be – though we contacted Apple to ask if there was a more specific timeline for the update they were unfortunately unable to give us any more information.